Tony Youn grew up up one of two Asian-American kids in a small town of near wall-to-wall whiteness. Too tall and too thin, he wore thick Coke-bottle glasses, braces, Hannibal Lecter headgear, and had a protruding jaw that one day began to grow, expanding Pinocchio-like, protruding to an unthinkable, monstrous size. After high school graduation, while other seniors partied at the shore or explored Europe, Youn lay strapped in an oral surgeon’s chair as he broke his jaw, then reset it and wired it shut for six weeks. Ironically, it was this brutal makeover that led him to his life's calling -- and the four years of angst, flubs, triumphs, non-stop studying and intermittant heavy drinking that eventually earned him an M.D. Thanks to a small circle of close friends and an obsessive drive to overachieve, Youn transformed from a shy, skinny, awkward nerd with no confidence and no clue into a renowned and successful plastic surgeon. 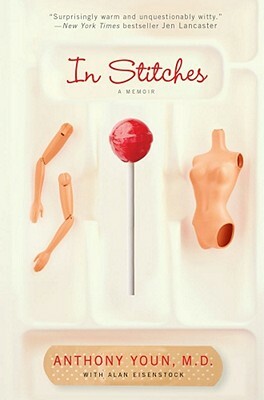 In Stitches is a heartfelt, candid, and laugh-out-loud memoir of one man's bumpy road to becoming a doctor and learning to be confortable in his own skin. “Tony Youn traces his success to a stern Korean father and his own fanatical work ethic -- but the real secret is his fabulous sense of humor. If you're contemplating medical school, you'll need three things: resilience, caffeine, and In Stitches -- a raucously funny and genuinely affecting account of what becoming a doctor is really like.” —Audrey Young, M.D., author of What Patients Taught Me: A Medical Student's Journey.